The chemical industry is built on catalytic processes. 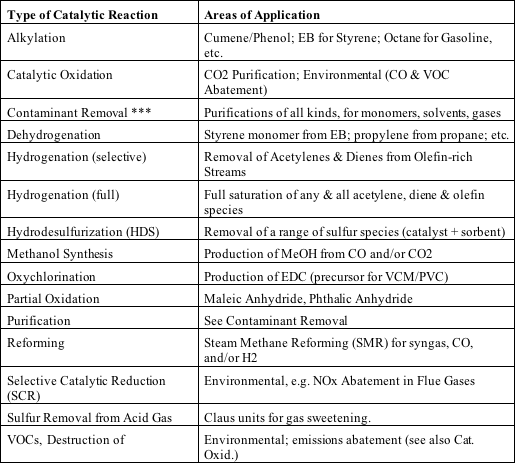 Some key industrial catalysts are mentioned in the table below. At RCI, our focus is primarily on Purification, where precious metal catalysts, base metal catalysts and/or adsorbents can be used to remove a variety of contaminants from gases and liquids. Contaminants which can be removed using our know-how combined with materials from our portfolio include O2, H2, CO, hydrocarbons, H2S, COS, chloride, mercaptans, mercury, arsine, phosphine, and moisture. Please let us know about your application.